Home » Blog post » Color Index 2: Over 1500 New Color Combinations. For Print and Web Media. CMYK and RGB Formulas. Color Index 2: Over 1500 New Color Combinations. For Print and Web Media. CMYK and RGB Formulas. By Jim Krause. 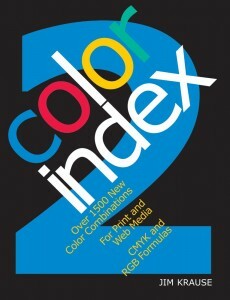 Color Index 2 contains hundreds of different color combinations, each with an accurate formula for both print and web use. You’ll easily find the best colors for your piece with chapters organized by dominant hue, and with unique expansion palettes—sets of four related hues arranged from dark to light—that allow you to explore even more color combinations for limitless possibilities. Gloria: I am using this book to coordinate colors for my scrapbooking. It has lots of possibilities and I have gotten many ideas from it. Would have liked for it to be a little larger format, but this is a handy size to carry.